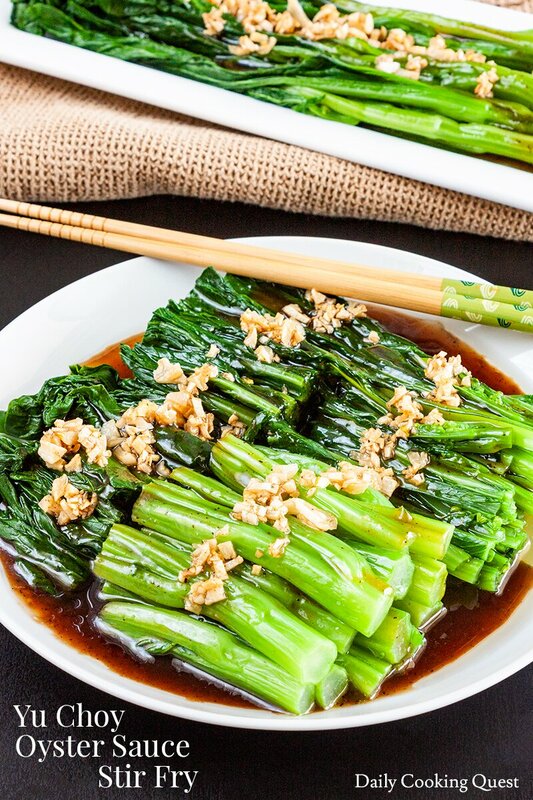 Yu choi is probably the most common Chinese greens served in any Chinese restaurant the world over, and this recipe for yu choi oyster sauce stir fry is truly a classic. Simply master the sauce recipe, and the world of wonderful Chinese greens stir fry will be yours. 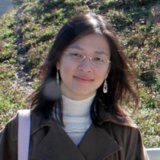 Many years ago, me and my then boyfriend (now husband) took a trip to New York City. Armed with a Lonely Planet (Yelp wasn’t even a thing yet! ), we hunted down this one tiny Chinese restaurant in New York Chinatown. It was almost closing time and we hunkered down and ordered a plate of their Chinese greens and another dish. Two minutes later, out come this one plate of yu choi stir fry, and we inhaled the whole thing before the other dish was out! We declared that the best Chinese greens ever. Looking back, hunting down a restaurant in NY Chinatown when every store was close to closing time was definitely not the safest thing to do, but boy, that one plate is truly worth the risk. We still remember that one dish after all these years! You know the biggest secret of preparing Chinese greens stir fry? You don’t even need to stir fry! 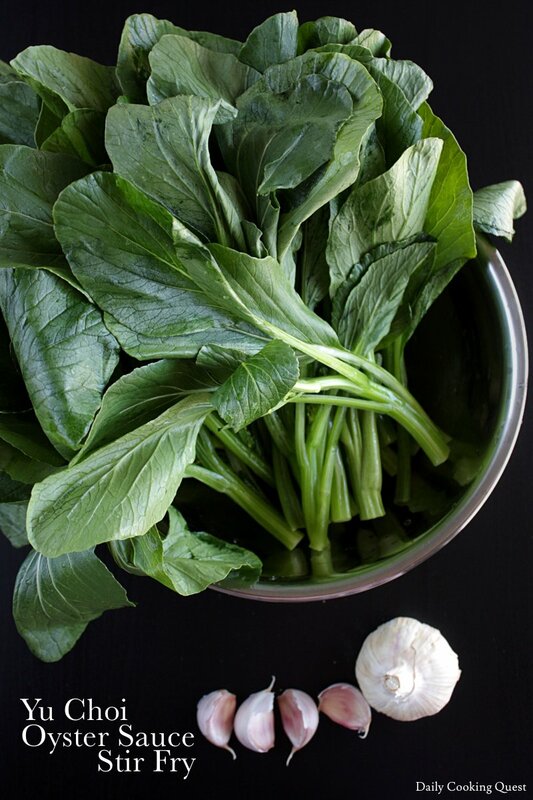 The best and most reliable method is actually by blanching your greens. Each greens needs slightly different blanching time. Over time you will learn and memorize which one needs a shorter time, and which one needs a longer time. The best analogy is like when you prepare a pot of pasta. Your angel hair will take a much shorter boiling time compared to your fettucinne. And just like pasta, stop blanching your greens when they are al dente. If you love this recipe, definitely play around with other greens, such as bok choy, broccoli, or broccolini. You can even add some protein to your greens, try adding some fried tofu or thinly sliced chicken breast. Wash and drain the yu choi to remove grit and dirt. Drain and set aside. Bring a pot of water to a rolling boil. Salt generously, and add the yu choy. 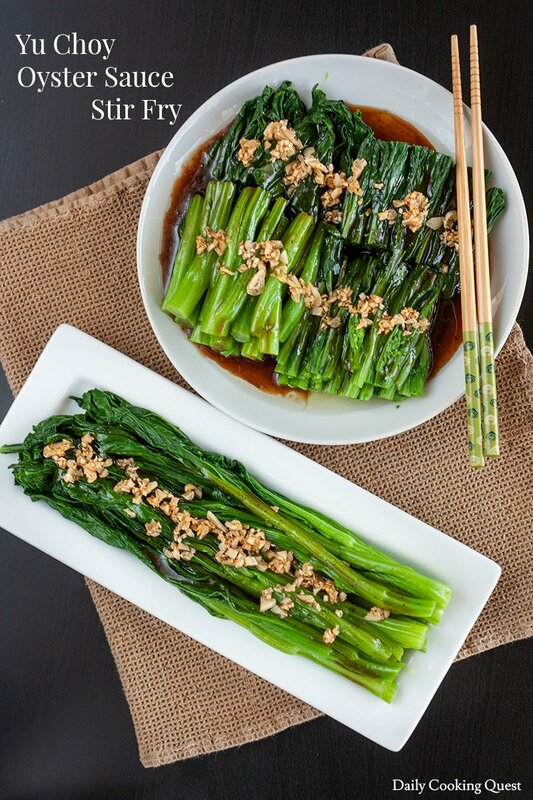 Once the water boils again and the yu choy turns a brighter shade of green, start testing to see if it is crispy and tender to your liking. It really shouldn't take more than 2 minutes! Drain and place on a serving plate. Set aside. (Or you can shock in ice water first, then drain again and place on a serving plate). 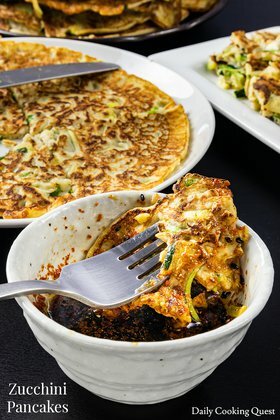 Serving tips: you can serve the yu choi whole, or cut them first into bite size lengths. Heat oil in a frying pan. Add oyster sauce, water, sugar, and ground white pepper. Stir until the sauce bubbles. 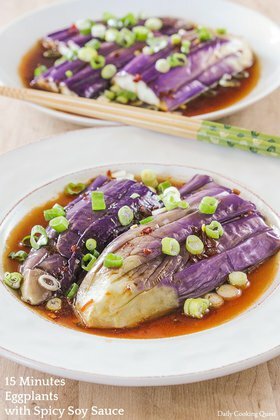 Turn off heat and pour the sauce on the arranged yu choi. Give the frying pan a quick clean. Heat the oil and stir fry the garlic until fragrant and garlic turns golden brown. Turn off heat and pour the garlic oil onto the yu choi. Serve immediately. 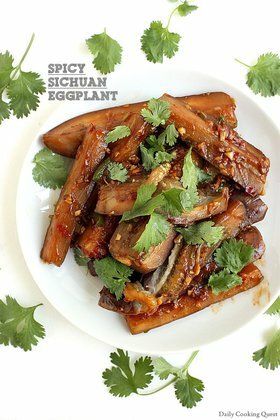 For years, I tried all kinds of you choi recipes. This recipe is the best ever. I'm never looking for another. My husband loves it, and so do my kids. The garlic oil is the kicker! Thanks for the high praise Leah. :) This is my go-to recipe for preparing all kind of Chinese greens. My family loves them like this, and I pretty much must make a variation of this at least once a week.